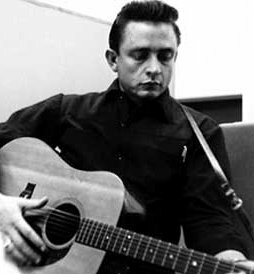 “Although I never met Johnny Cash, I have to count him as an important influence in my music and my life. When I was a kid I asked my mother for a phonograph player one Christmas and begged her for three LPs…the Elvis Christmas album…Clyde McPhatter and the Drifters…and the first Johnny Cash Sun album. When I learned how to play the guitar from making diagrams of Buddy Holly’s fingers from the third row of an Alan Freed Rock n’ Roll show the first song I learned was,”Peggy Sue”, the second was, “I Walk The Line”. As an African-American it was difficult to explain Johnny Cash to my inner-city friends, most of whom had heard the name…but not the music. Then I turned them onto his chilling, near monotone delivery of songs that had deeper meaning than most of the pop music of the day.When they listened…they understood…they knew that Johnny Cash was real!! What amazes me about Johnny and his career,was his ability to stay relevant . I’m 62 years old and after writing songs for over 40 years I’ve wondered if I still had anything left to say…….then I saw Johnny’s video of “Hurt” and realized age can make you more relevant!